Beautiful Tri-level Condo in the Lotus Walk Community of the Grove District Anaheim Resort area. This home Features 2 spacious Bedrooms that include a Very large Master with walk in closet and 2 full and one half Baths. The very spacious open floor plan has a large living room and dining area and a modern kitchen with plenty of cabinets and counter space. This home is in a premium location with a balcony overlooking private garden area with water features. There is a huge Tandem Garage with plenty of room for parking and enough left over for storage. The garage has direct access to the first floor. There is also plenty of visitor parking.The community has a Beautiful Recreation area that features a large pool and spa. 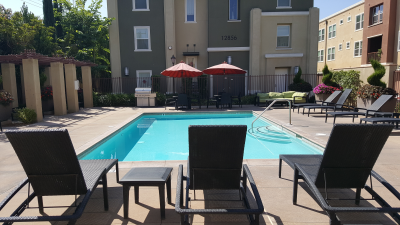 The home is situated in the Grove District Anaheim Resort, Near Disneyland and the Hotel district and across the street from the New Wolf Lodge Indoor Water Park.. Also great restaurants such as Outback Steakhouse, Joe's Crab shack and Morton's Steakhouse to name a few. All the shopping you need within walking distance and easy access to the 22, 5 and 57 Freeway's. This home is a must see!